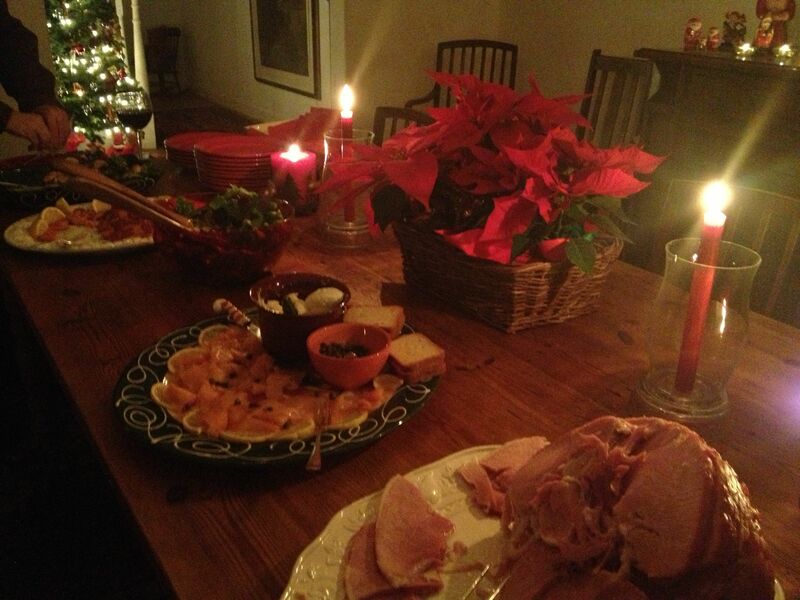 Every Christmas we give a small open house the evening of December 25th for about twenty friends who live close by. Dogs are invited too.The house is lit by candles and with the Christmas decorations up it’s a very pretty party. (If there’s one thing you should splurge on for parties or dinners, or for anything that takes place after dark, it’s candles. Candlelight makes all people and places beautiful). 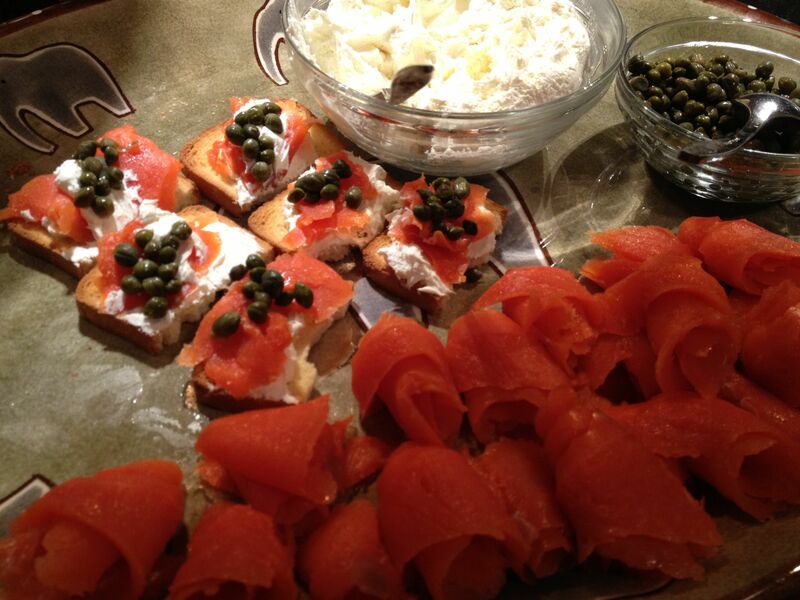 – Smoked salmon – with: whipped cream cheese, capers, lemons, and dark cocktail bread or small toasts. You can always add a mac and cheese casserole to this, or anything you feel a wild urge to cook – but if you’re a little tired after Christmas and just want to hang out with your friends, why not do it as easily as possible? A lovely buttery (and reasonable) Chardonnay to serve with this is Toasted Head. 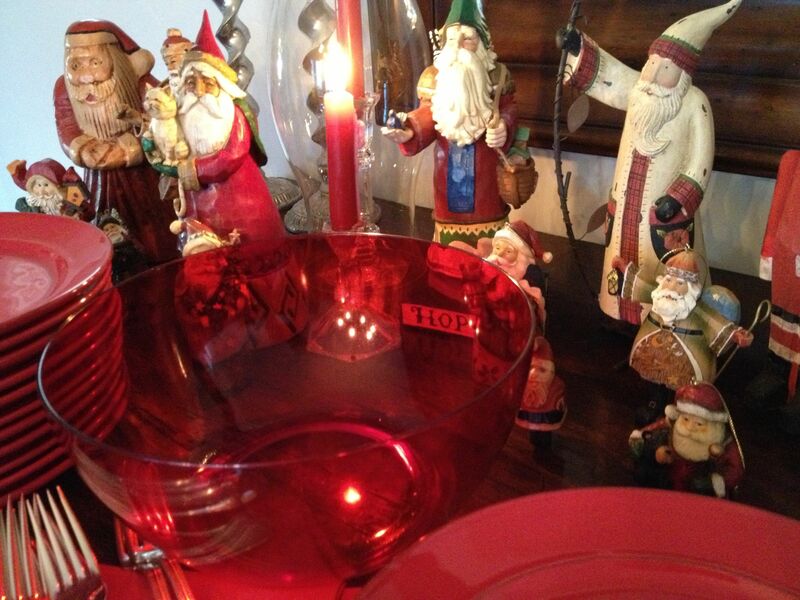 The red plates in the picture above came from a Pottery Barn sale last year, and the red bowl is made of plastic; I bought it at Albertson’s for $3.99. Here’s something I just learned. In the past I’ve always presented a slab of smoked salmon on a platter with the cream cheese and lemons and capers in a do-it-yourself kind of arrangement. But this past weekend our friends Nick and Stuart gave a dinner party and I brought my super lazy appetizer, a slab of salmon, and lo and behold Nick and another friend, Aleen, did wonders with it. They pulled off little pieces of salmon and Nick put some of them on dollops of cream cheese on toasts, then smaller dollops on top to anchor down the capers. He filled half a plate this way and Aleen made little curls of the rest of the salmon and tucked in pieces of lemon. It seemed so much more delicious to eat this way. So you know what I’ll be doing before the Christmas buffet this year.